To be honest, I couldn't find a thing on Les Randall. Judging from the sound, this recording easily could be a 1960s cut but it is more probable that it dates back to the 1970s. 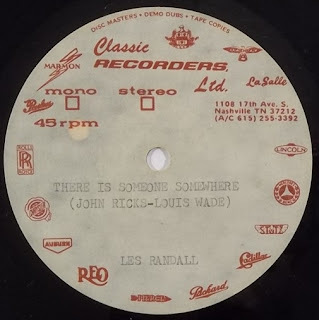 I also have no info on Classic Recorders Ltd. except for the adress which is shown on the label and that the company was active in the 1970s. Flip side is called "Someone Always Gets Hurt." UPDATE: VertigoJohn pointed me towards a YouTube video called "The Gates of Graceland," in which host Tom Brown and Graceland's archive director Angie Marchese find another acetate by Les Randall IN Graceland, entitled "You Take the House, the Dog, I'll Take My Heart." The other side was "Reflections of You," a Carl Nichols-Fred Kelley composition sung by Kris Arden. Looks like Les managed to pitch some of his tunes to Elvis Presley. You might find this interesting regarding Les Randall - in relation to Elvis! Cant findthis record anywhere, why the car names on the record itself note stutz is one of the names. Came with the car.